This eye-catching round laundry basket with a flat lid adds a contempory feel to any room. It makes the perfect laundry basket but is equally useful as a linen basket, toy basket or blanket basket. Its tapered shape and flat lid means it takes up minimal space. See individual listing for Medium. The baskets are made using traditional weaving techniques, out of sustainable ndiorokh grasses and strips of plastic traditionally used for making basin mats. 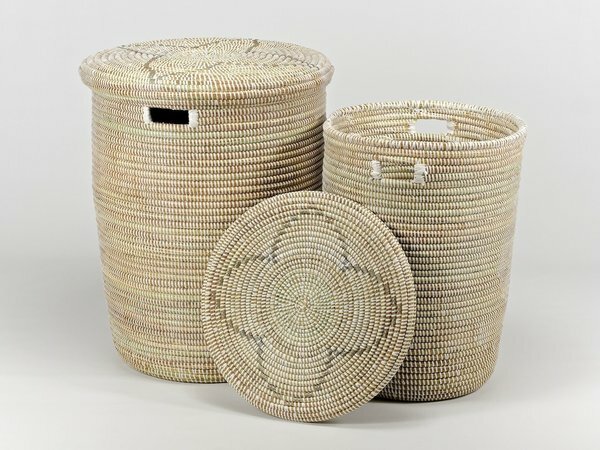 Artisanne blends Senegalese weaving techniques with modern designs to create household storage that is stylish and practical. Working directly with the weavers, Artisanne ensures each weaver earns fair, regular and secure income as well as making sure the baskets meet the highest standards, and retain their elegance and uniqueness too.